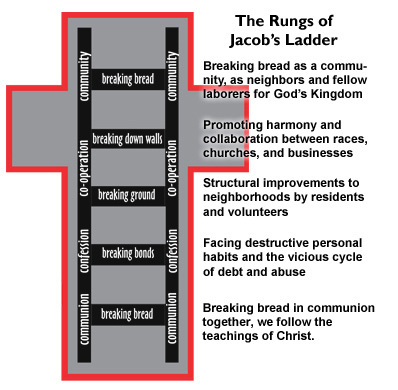 Jacob's Ladder™ Community Development Corporation practices holistic community revitalization in blighted, distressed inner city areas. Our vision includes re-imaging broken communities - new housing, new schools, and building green spaces and parks, as a testimony to the creative and loving power of God. Our name draws from the Old Testament story of Jacob, a man who dreamed of a connection between heaven and earth, a prelude to Christ's ministry on earth. We are committed to relationship building between neighbors, businesses, and faith-based groups. We co-sponsor an annual spring work festival with Coca Cola and Clean Memphis as co partners. In addition, we've supplemented early childhood education in the Belt Line by opening a Youth Enrichment Center. The Center is a sanctuary place where children can learn life skills like gardening, cooking, computer literacy and financial responsibility, along with art, music and drama instruction and attaining valuable life lessons from faith-based story-telling.